Follow the Sharks vs Kings stream, score and result of the 2018/19 NHL season at the Staples Center in Los Angeles. Keep following for the live outcome on VAVEL USA. (2:06): GOAL! Kevin Labanc scores the OT winner! Sharks were controlling the puck, Kings were unable to make a change and were out on the ice for over two minutes, tiring them out, and the Sharks punished them. Sharks win 3-2 after OT. (3:55): Pavelski passes to Karlsson, Quick saves. Kopitar waits behind the goal while Kovalchuk and Doughty change, drives forward, Toffoli takes a slapshot, saved. (4:25): Kopitar enters the zone, his shot goes high. (0:12): Back to even strength and we will see overtime in this game! (1:17): Couture's shot falls to Pavelski but nothing comes of it. A brilliant save by Quick, poking out the puck right before Couture. (2:21): Kempe gets called for slashing, the plot thickens as we approach the end of regulation in this contest between the Sharks and the Kings. (2:50): ​Kings got stuck in their zone for a while, but a poor pass by Labanc sets them free. (4:20): Vlasic tries to fire through the traffic, shot blocked. (5:47): Back to even strength, Kovalchuk loses the puck, Sharks get a 3-on-2 and get a shot, but Quick holds. (6:42): Huge chance for the Kings! Jones finds himself outside the crease, Braun blocks the empty net and Carter can't get it over him. (7:42): Kings are lucky to not go down a goal here, a shorthanded two-on-one, Quick saves the shot. (8:07): Wagner with another opportunity thanks to his speed but Jones gets a pad on it. Sorensen gets called for hooking, Kings have the man advantage. (8:42): Doughty charged into the Sharks' zone, centered it to Kempe but had his stick lifted. (10:05): Big shot by Meier as the puck rebounded to him, but his shot went over. (11:09): Amadio throws the puck ahead of him, Wagner gets there and Jones pulls out a great pad save to keep the score level. (12:20): The power play is over, no shot by the Sharks. (13:51): Karlsson passes to Burns who goes for a shot right away. The Swede was looking for a rebound but Kings clear. Also we are currently one linesman short, the reason is unknown right now. (14:23): Interference call on Jeff Carter, shoving Pavelski. (16:52): Suomela got a good shot on Quick and Lewis could have had a breakaway but the puck skipped over his stick. (17:58): Solid penalty kill by the Sharks, keeping the Kings out of the zone for the first 40 seconds and prevented huge opportunities. The Kings get a couple of shots towards the end, but it's still 2-2. And we're back for the third period! Goodrow gets a minor for contact with the head, the Kings are starting the period on the power play. (0:00): The period ends, Muzzin gets hit in the head with Goodrow's elbow right at the buzzer. A tussle broke out with the goalie Jonathan Quick getting involved. We might see the Kings begin the third with a power play. It's 2-2, still a wide-open hockey game! (1:00): Vlasic took a shot, Quick struggled to control the rebound and Suomela nearly got to it. (1:05): Donskoi deflects the puck just in front of Quick, the goalie saves and we're back to 5-on-5. (2:42): Kings have controlled the puck so far, Kovalchuk receives it from Doughty, one-times it and goes just wide. (3:22): So the power play lasted just 4 second, captain Pavelski trips up Lewis, 4-on-4. (3:27): Pearson gets called for hooking, here comes that Burns/Karlsson duo. (4:47): A nice move by Kempe after some passing, the Swede found himself between defensemen but just can't beat Jones. (5:42): A huge miss by Meier! The Sharks have enclosed the Kings and just have shot after shot. Meier sees an empty net, Quick gets across quickly and the winger hits the post. (7:12): Kings ice it, they haven't had a lot of the puck since their power play. (8:12): Quick pulls out a couple of great saves against Karlsson and Suomela as Sharks have really put the pressure on after returning to full strength. (9:52): Kopitar drives into the net, but that was the only opportunity for the Kings so far on the power play. (11:11): Suomela chops down Pearson, Doughty is back on the ice for the power play. (11:38): Carter won the puck right in front of Jones, but the Sharks goalie kees a cool head. (12:13): It is now clear that Meier hit Doughty's left knee with his stick, we will see if he gets punished after the game. The Kings giving him some extra physical treatment when he's on the ice now. (13:26): Rookie Austin Wagner goes on a breakaway but Jones pulls out a save. If Doughty doesn't come back, the Kings might be in trouble. (14:37): Drew Doughty stays down on the ice, hobbles off the ice with the physio, dragging his left leg. He might have been chopped down off the puck. Looked very angry with the officials. (16:20): pearson gets some space, takes a shot and it trickles behind Jones, just wide of the net. (17:05): ​Dillon gets a shot from the blue line but it's blocked by the Kings. (19:23): Tyler Toffoli ties the game! pearson throws the puck at Jones, it bounces behind the goal and Toffoli tucks the puck behind Jones. 2-2! (0:00): A very eventful first period behind us, Sharks lead the Kings 2-1. (0:11): Sharks have been very active since Kopitar's goal and they get a faceoff in the Kings' zone. (1:45): Sharks still lead 2-1, Iaffalo and Forbort assisted on Kopitar's goal. (2:45): GOAL! Kopitar draws one back. Iaffalo deflects a shot by Forbort, falls to Kopitar on the back door and the Kings are back in it! (4:47): Kovalchuk picks up the puck and takes a shot, saved by Jones. (5:21): Second of the season for Evander Kane, Finns Antti Suomela and Joonas Donskoi get assists. (6:12): GOAL! Thompson loses the puck along the boards to Suomela, who passes to Kane and his shot beats Quick at his near post. 2-0 Sharks. (7:16): Thornton takes a shot from a tight angle right into Quick's glove. (8:37): Pearson turns over the puck between the circles, plays it to Toffoli who takes a shot, but Jones is only about two feet away and has it covered. (9:09): ​Kempe wins the puck with a good hit, brings it back to Muzzin whose shot goes way over. (10:01): It is a Timo Meier goal, Vlasic and Thornton receive assists. (10:18): GOAL! Marc-Edouard Vlasic threw the puck in from the blue line, gets deflected by Meier and the Sharks lead 1-0. (11:22): Solid play by the Kings, Kovalchuk wins the puck against Burns, puts in back in front for Kempe whose shot is blocked. Kovalchuk then dived to save the zone, but the power play is over. (12:09): Doughty takes a shot, misses the net narrowly, it comes back off the boards but Jones covers. (12:55): Braun trips up Kovalchuk and we get our first power play of the night, this one is for the Kings. (14:43): Karlsson skates into the Kings' zone, finds Donskoi who takes a shot and a deflection makes the save tough for Quick, but the goalie keeps the game scoreless. (16:05): ​Shot deflected into the netting, Sharks have been the better, more active team early on. (17:32): Kane puts in a dangerous puck in front of the crease but Quick pokes it out before a Shark got to it. (18:22): A nice centering pass by the Sharks but Donskoi struggles to receive it, Sharks lose the zone and ice the puck. We are now just minutes away from the puck drop at the Staples Center! As for rookies, the Sharks have decided to sign the undrafted Antti Suomela from JYP in the Finnish Liiga. The 23-year-old made his debut against the Ducks on Wednesday, playing as the third-line center. The Sharks are currently enjoying a clean bill of health with no injuries to their roster, which is why you see a player with the qualities of Evander Kane playing on the third line. This is their best possible team, so the Sharks should be picking up some form early on in this season. The biggest story out of San Jose has been the arrival of Erik Karlsson. The Swedish defenseman has arrived in California after a trade and is in the final year of his contract. The Sharks opened their season on Wednesday in front of a home crowd, but started their season with a 5-2 loss to their division rival Anaheim Ducks. Austin Wagner is going to be making his NHL debut tonight, a fourth-round pick by the Kings at the 2015 Draft. LA are dealing with three injuries to players on their roster right now. The most significant is the finger injury of Dustin Brown, which has ruled out the winger for this game at least. Brown played a lot of top line minutes last season, and had a career-high of 61 points. Jonny Brodzinski and potential rookie Gabriel Vilardi ​have also been ruled out. The Kings also signed their franchise defenseman Drew Doughty to an eight-year, $88 million contract. The contract kicks in next season, meaning that Doughty will be inked to the Kings until he is 37 years old. This will be the season opener for the Kings, whose off-season was defined by one name; Ilya Kovalchuk. LA landed the Russian veteran and lured him back overseas after years in the NHL and a Gold medal with the Olympic Athletes of Russia. Kovalchuk is expected to slot in on the top line and play a lot of powerplay minutes, but will his impact be enough to take the Kings further than last season? 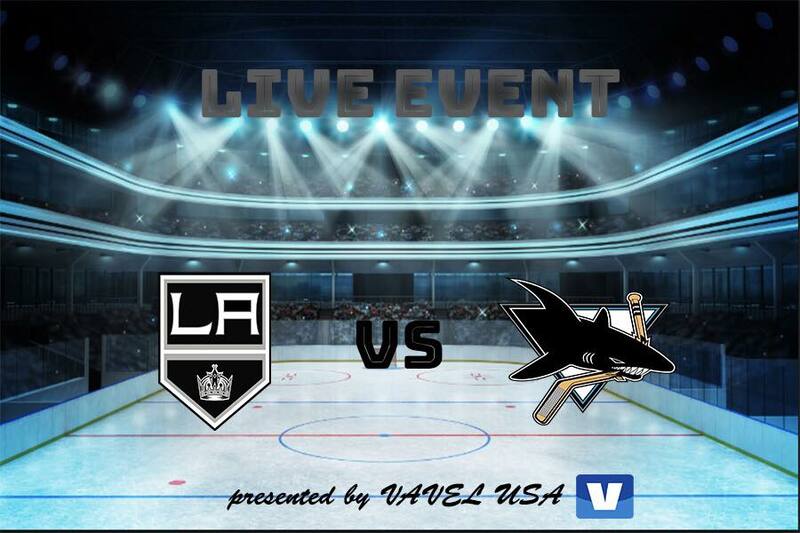 Welcome to Vavel's coverage of tonight's game between the San Jose Sharks and Los Angeles Kings. My name is Jakub Bobro and I will guide you through everything you need to know before the game and the game itself once it rolls around at 7:30 PM Pacific time. Follow along for updates!